Buy the Farm . . . Share: What The Hake? Today, I had the day off. While this may not sound like a big deal to you this is the first day I spent at home, off from work, in about a month. It was glorious. I set out early to go to shopping and restock our woefully understocked fridge and pantry. Our freezer needed no such help. After a discussion with my sister-in-law at Christmas it was decided that every salad I make is like a poison to her. You see, she hates fruit in salads. 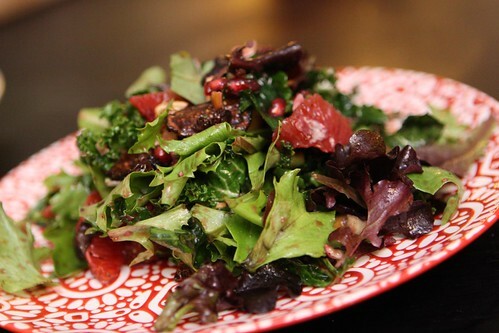 I happen to enjoy adding citrus and other fruits and nuts to salad for flavor, acidity, color, and just plain fun. Tonight's salad, while vegan and fairly healthful, will likely make her recoil in disgust. I tossed some chopped kale with currants, dried figs, toasted cashews, blood orange segments, pomegranate seeds and juice, balsamic vinegar, olive oil, salt, and pepper. I also tossed in a small amount of baby greens just for fun. Lisa, don't worry, next time you come to visit my salads will be entire fruit-free. That's the promise I make to you. My local fishmonger had the most amazing looking hake today that I had to buy some. Once I saw it I knew what dinner was going to be tonight. I seared it in a pan and finished roasting it in the oven. 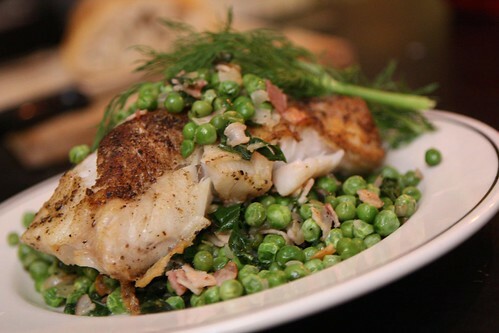 While it was in there I rendered some pancetta with olive oil and butter then threw in some diced vidalia onion, peas and kohlrabi greens which I served with along with the roasted hake loin. I garnished them with fennel fronds, partially because I thought the flavor would be nice and partially because I like the word fronds. After taking a bite Jen said, "Can I tell you something that is not going to sound like a compliment but it totally is?" "What is that?" I said. "This fish tastes like the most delicious chicken McNuggets I had as a child." "You were right," I said. "But thank you." 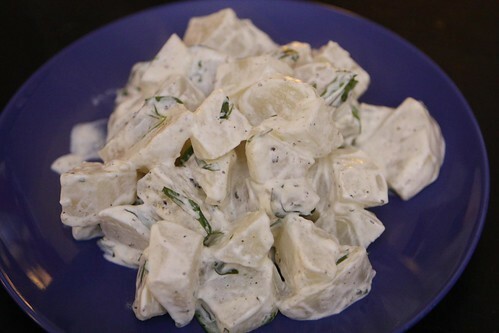 As a side dish I boiled some kohlrabi wedges tossed with sour cream, tarragon, salt, and pepper. This was in our continued effort to no longer dislike tarragon. Another successful mission! I have long not loved the IPA. Recently, however, particularly in the last year, I have grown more appreciative of the style. 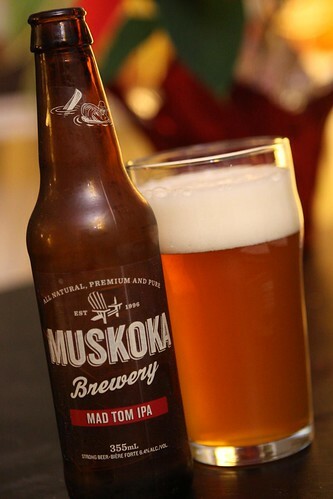 Tonight I selected this Christmas gift which was the Mad Tom IPA from Muskoka Brewery. It comes in at 62 IBUS, according to the website, but to me it tasted a little more like 162 IBUs. This beer was very good but it definitely pushed my outer limits of IPA appreciation. I've had beers that technically had higher IBUs but this one made me make a face like that guy in those Keystone Light commercials from the 90s. Does Keystone Light still exist? I'm guessing that if it does it makes you make a similar bitter face but instead of being caused by dry-hopping it's caused by bitter disappointment. Wait sa minute! Jen could not have compared the hake to Chicken McNugets. Her sister swears that she and Jen only ever had grilled cheese sandwiches even when the other kids' parents were treating them to McNuggets. She muist be imagining what she thought these McNugets tasted like. That's not true! We definitely didn't get to have Chicken McNuggets as often as we wanted, but in fairness, we wanted Chicken McNuggets every day, and it wouldn't have been a good move to let us have them as often as we want. Their scarcity in our lives made the taste even more memorable.